We land in Dublin at 6:00 a.m., then jump on the flight to Toronto, Ontario, Canada. We arrive back in Minneapolis at 3:30 p.m. The love of God through God’s people has been clear to us throughout these weeks in Ethiopia. And now we return to the loving embrace of God’s people in Minneapolis. We're home! We're well and happy to see family and friends again. Ron is on his way to his home in Cross Lake, and Rachel is returning to school in Eau Claire. I'll see many of you in church on Sunday. Thank you for your prayers. The people of God in Aida send you greetings. We wrap up our time in Ethiopia today – including a tour of Addis Ababa, shopping for mementoes, and meeting with any EECMY leaders we missed earlier this week. Then we’ll pack up. Rachel, Ron and Karen will board our flight tonight and jet toward Dublin, Ireland. Girma will stay behind for some time with his family here. “You shall not murder. You shall not commit adultery. You shall not steal. You shall not give false testimony against your neighbor. You shall not covet your neighbor’s wife. You shall not set your desire on your neighbor’s house or land, his male or female servant, his ox or donkey, or anything that belongs to your neighbor” (Deuteronomy 5:17-21). This text is loaded with negatives – what not to do to our neighbors. How can we say it in a positive way? God’s words to Moses are about respecting our fellow human beings, about loving them so that our wants, our desires don’t come first. It makes life richer. It honors God’s whole creation. We are tourists today, seeing the sights in Addis Ababa and doing a little memento shopping. Probably the most impactful was the Red Terror Museum, recounting the events during the Derg, the Communist government during the 70s and 80s. So many of our friends in the church here were imprisoned during this time. The General Secretary of the church was assassinated. We are stunned at what evil people can do. Tonight we start the long journey back to Minneapolis. God has blessed us during these two weeks. We will run out to the Mekane Yesus Seminary, the primary seminary of the church, and also visit the Gudina Tumsa Foundation Center. It’s good to maintain contact with our brothers and sisters in these institutions of the church, to learn from them how they are sharing the Good News. “Honor your father and your mother, as the Lord your God has commanded you, so that you may live long and that it may go well with you in the land the Lord your God is giving you” (Deuteronomy 5:16). We should fear and love God that we may not despise nor anger our parents and masters, but give them honor, serve, obey, and hold them in love and esteem.” That’s what Martin Luther says about this commandment. Notice he begins with fearing and loving God. As Pastor Samuelson would say, “It’s all God’s.” It’s where all of life begins. It’s the basis for all our actions. 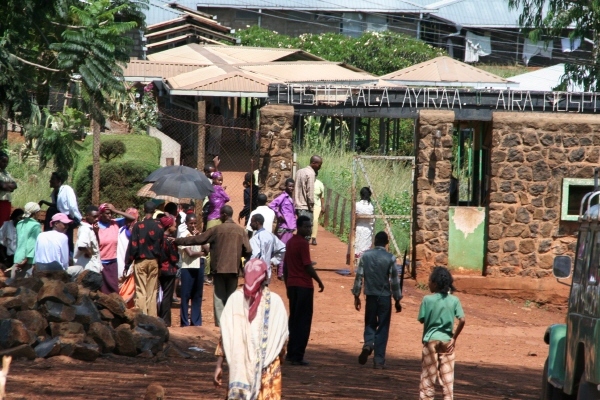 More meetings with church leaders will help Ron as he formulates his report on Aira Hospital. Addis Ababa is a huge city, teeming with people. There are no traffic lanes, so many cars, buses, vans, sheep, goats, and people sharing the road, and few stoplights, so driving here is not for the weak. We are happy to have such a skilled driver, Birhanu, who gets us safely to every appointment, knows where to go (even though addresses are nearly non-existent, so directions refer to landmarks), and makes sure we are safe. We will be meeting with EECMY staff today, reporting on our time in Aira and thanking them for their warm welcome to us. labor and do all your work, but the seventh day is a sabbath to the Lord your God. On it you shall not do any work, neither you, nor your son or daughter, nor your male or female servant, nor your ox, your donkey or any of your animals, nor any foreigner residing in your towns, so that your male and female servants may rest, as you do. Remember that you were slaves in Egypt and that the Lord your God brought you out of there with a mighty hand and an outstretched arm. Therefore the Lord your God has commanded you to observe the Sabbath day” (Deuteronomy 5:12-15). for his steadfast love endures forever . . . There it is: God acts because “God’s steadfast love endures forever.” That’s the promise. That’s the reality. Find time to remember God’s work and God’s love for us. Rachel visited the Korean Hospital, one of the newest and most up-to-date hospitals in Addis Ababa. One of her friends from college is working there this term, so Rachel was able to meet her and tour the hospital. We picked her up just before dinner this evening. Ron, Girma and I visited the Mekane Yesus Seminary campus today. It was convocation, as they welcomed students back to campus. I wanted to make contact there for our potential Cantare trip next June. The dean of the music school is very interested in our visit, and he mentioned "continuing contacts and relationships." Who knows where this will lead? I smiled at the banjo (which he plays) hanging on his wall. Then we ran over to the communication unit of the EECMY, which is right next to the seminary. They publish printed resources, prepare radio broadcasts and other audio programming, and are beginning to develop television programming and other video programs. Ron saw in them a resource for the Aida Hospital, as they inform the people in the area they serve of their work with cleft palates, fistulas and eye surgery. Every visit brings new information and new ideas! In the late afternoon we met with Girma, the head of the social ministry department of the church. Ron had some questions about their structure, as he tries to complete his evaluation of the Aira Hospital. It was a fascinating conversation! Dinner with our friend Teklu was informative and fun (again), and then we headed home for blogging, work on the report that Ron is preparing, and rest. Thanks be to God for a wonderful day! At an early hour, we will begin the journey back to Addis Ababa. The soil in the west is a deep red. At some point during the trip, it changes to black, and we know that we have left the west and are nearing the capital city. It is bittersweet, leaving our family in Aira. We will stay at the American Guest House in Addis Ababa this night. “You shall not misuse the name of the Lord your God, for the Lord will not hold anyone guiltless who misuses his name” (Deuteronomy 5:11). Except that you do not fit any of our categories. we end up with an idol more congenial to us. what you have been toward us. transform the world even as you are being changed. who is the sign of your suffering love. Amen. It was another long day, driving from Aida to Addis Ababa. However, it was a long day filled with the glories of God's creation and the grace of God's people. We spent many hours just looking out the windows of the LandRover, viewing the amazing countryside -- the deep gullies, the lofty hills, the fields like a patchwork quilt of various shades of green and yellow and gold, the men sauntering down the road, the women stooped over with bundles of sticks or grain, the little boys darting here and there as they chase goats and sheep, the little girls walking with such dignity and grace, the footpaths cutting through groves of trees or grassland, women and children standing in front of grass huts watching us shoot by. Do they wonder where we are going? Do they wish they could venture beyond their small village or farm? I wonder . . . .
We stopped in Nekemte for late breakfast/early lunch, then drove on through to Addis Ababa, where we were glad to find our rooms at the American Guest House. Tomorrow we have people to meet and places to go! Today we will worship with the people of God at Lalo Aira Congregation, our companion congregation. We will have a chance to speak to them and receive their blessing and their prayers, a deeply moving and enriching experience. We are one body in Christ. Moses summoned all Israel and said: “Hear, Israel, the decrees and laws I declare in your hearing today. Learn them and be sure to follow them. The Lord our God made a covenant with us at Horeb. It was not with our ancestors that the Lord made this covenant, but with us, with all of us who are alive here today” (Deuteronomy 5:1-3). “It was not with our ancestors . . . but with us, with all of us who are alive here today” – that’s to whom God comes. With us – at Good Shepherd, at Lalo Aira Congregation, throughout the world – in the Word, in the story, in the bread and wine. God is here! We arrived at Lalo Aira Congregation as the service began, and were ushered to the front bench. The service was the traditional style – probably taught to them by the German missionaries, but in the Oromo language. I heard “All Glory Be to God on High” as the hymn of praise – although it had a little Oromo swing to it. The choir music was very different though – spirited and upbeat. They sing from their throats and in unison. And they sway as they sing. Rachel especially appreciated the up-tempo music. I must say, worship is a very emotional event for a lot of the people there. We were invited forward to meet the congregation. I made a brief greeting, then Girma introduced us (in Oromo, of course, so we had no idea what he said). When he talked about Rachel, there was great laughter throughout the congregation. We found out later that Girma said Rachel was 22 and looking for a husband. I’m not sure Rachel appreciated that – but she’s a good sport! After 3+ hours of worship, we were invited to lunch with the elders of the congregation. We went to a restaurant uptown in Aira, and spent some time talking. Girma spends a lot of time translating, because not everyone of the elders can understand English. It was a congenial, warm time. After lunch, Girma ventured out to see family who live in Aira, and Ron, Rachel and I walked back to the Guest House. After a little rest, I prepared for visitors we knew were coming and Ron worked on a brief report for the synod president. At 4:00 the synod president, Rev. Iteffa, and Rev. Tadessa appeared. We had tea together, then talked about the items on their minds. Rachel had intended to go look at capped springs in the countryside with Dr. Toren, a pediatrician who is working here for three weeks. He had worked here many years ago, when his children were young, and now returns intermittently to help at the hospital and teach at the nurses school. But when rain threatened, they called off the expedition, not sure about the safety of the roads. In the evening we went to a dinner hosted by the chief medical officer at the hospital, Dr. Tariko. He make a brief speech after dinner, thanking Good Shepherd for their support in the past and funding Global Health Administrative Partners trip here, then presented us with a certificate of thanks. He obviously enjoyed working with Ron and Rachel this past week. Back to the Guest House, then more work on a report for President Iteffa by the four of us. It was a late evening. Tomorrow is our last full day in Aira. Tuesday we leave early for Addis Ababa. It has gone so fast! We’ll go separate ways again – Ron with hospital administration, Rachel with hospital staff, Girma with the secondary school leadership (where he supports several students through scholarships), and Karen with the seminary. Girma and Karen will also spend time with President Iteffa, the president of the synod. In the Ethiopian culture, names are so important. When you meet someone, often they will tell you what their name means, and many of them relate to their faith. For example, Girma means “grace.” Abdi means “my servant.” Gabriael means “God is my strength.” Choosing a name for a baby involves more than just a pleasant-sounding name; it includes choosing a name with a meaning that is significant, meaningful to their faith and life. What would your name be? It’s late evening, and I’m sitting in the Guest Cottage, wondering where my fellow travelers are. They went to see the clinic in Chalia today, and expected to be back by 5:00. Where are they? I will not panic, but I’m close. Now the electricity went off. We have light from the generator, but only in selected places. In the afternoon I met with the women seminary students at Rev. Tadese’s request. We talked together about the challenges they face, and the strength they require, then they left with my feeble Oromo blessing: “Waqqau sei ebesu” (God bless you.) They grasped my hands so urgently. Then I spent an hour with editors from the Aster Ganno Society. They are translating key writings into Oromo. We had a marvelous time together. Aster Ganno helped Onesimus Nesib translate the Bible into the Oromo language. Then it was off to Lalo Aira Congregation to pray with the elders. I expected Girma to join me there, but he didn’t show. So, the elders met with me, told about the near completion of their new church building and about their developing outreach program. I got a tour of the new building which is under construction. Good Shepherd contributed a small amount to the building fund through our Ethiopia benevolences; the elders recognized that gift. Then I left, and the elders went on to pray with each group meeting at the church that night -- including a Bible study group and several choirs. I walked back to the Guest House, eager to hear about the adventures of my fellow travelers, but they were not there. I paced. I sat. I paced some more. I started writing this blog. It was getting quite late, and very dark. I didn’t know how to find out where they were. Then, I heard Rachel’s laughter as they walked up the path. I don’t know if I’ve ever been happier to see three people! Today was an exciting day! Ron, Girma, Dr. Tariku (the hospital administrator and surgeon), two members of the BirbirDilla Synod staff and I traveled to visit two of the clinics in the area. We first went to a clinic in Dilia, a very small rural town that is difficult to reach by car. We made it there though with no problems. We got a tour of the clinic, and sat down and chatted with the nurse in charge. We also got to hang out with some of the kids at the clinic, which was super fun for me!! After going to the clinic we went to visit Dilia Falls. It was an hour hike to the falls and back, and we got a great view of the agriculture in the area on our way. We also met a little boy along our walk who became our tour guide! Our travel from Dilia clinic to Chalia clinic was very interesting to say the least. The dirt “roads” that we were traveling on were very narrow and filled with many obstacles, including hills, donkeys, streams, trees, and people. On our way it started raining which made it incredibly difficult to get up the hills. We got stuck in the mud twice! I was certain we were going to tip our truck, but no worries we made it! A little farther down the road it stopped raining, BUT – just our luck – our vehicle ran out of fuel in the middle of nowhere. I was picturing us walking for miles to find someone with fuel. But everyone got their cellphones out and were spread around the hillside trying to get service. Someone got service and were able to contact someone at Chalia clinic to bring us gas. It was an adventure to say the least! We finally made it to Chalia and met with the health officer that runs the clinic. It was interesting to see both clinics to compare and contrast the two; they were very different from each other. Dilia was a lot more rural and has many more obstacles to overcome than Chalia. After conversation and a tour we walked down to the Trade Building School that is on the clinic compound to have coffee and dinner. While there we met 16 Germans who were there doing missionary work. It was definitely a surprise! After all of this adventure we got back on the road and headed back to Aira, in the dark of course because that’s how the day was going J . We made it back to the guest house and found Karen who was extremely worried about us! We were supposed to back middle of the afternoon, but we got back at 7:30 . . . oops! Overall though it was an exciting and adventurous day! Today we will learn a bit about what has happened in Aira since our last time there. We anticipate spending some time with hospital administration and staff today – reviewing past evaluations and recommendations, seeing the current state of the hospital, and making a plan for the rest of our days in Aira. I can’t help but believe we’ll make a quick trip to the seminary too, maybe for tea and cookies under the trees with the students there. The Lord said, “I have indeed seen the misery of my people in Egypt. I have heard them crying out because of their slave drivers, and I am concerned about their suffering. So I have come down to rescue them from the hand of the Egyptians and to bring them up out of that land into a good and spacious land, a land flowing with milk and honey—the home of the Canaanites, Hittites, Amorites, Perizzites, Hivites and Jebusites. And now the cry of the Israelites has reached me, and I have seen the way the Egyptians are oppressing them. So now, go. I am sending you to Pharaoh to bring my people the Israelites out of Egypt” (Exodus 3:7-10). Moses was sent to Egypt to “rescue” the Israelites. In no way are we in Aira to “rescue them.” We are here to walk with them, to hear not only their cries but also to rejoice with them. We are here to be the church together. Sometimes that is what is needed – not to come with solutions, but to stand together in the face of difficulty, to bring new insights and experiences, to listen and hear, to respond with hope and encouragement. The reality is that the Aira Hospital is of vital importance to people in the Wolega area, one of only a few hospitals in the entire western part of the country. It is crucial that it become financially healthy. Ron’s work with the administration and Rachel’s observations of equipment needs will be part of that assistance. Personally, today was one of those days you never expect to experience. Rev. Tadese and I were surveying the area at Onesimus Nesib Seminary where the women’s dormitory will be build – a beautiful area toward the back of the campus, with a splendid view of the valley just off to the west. They have cleared the land, and are about to start excavating. The construction company owner was there, making plans, talking with Tadese. Then he asked Tadese if we could “bless” the site with a prayer, “dedicate it and prepare it for God’s work.” So Tadese, the contractor, two of his employees and I stood in a circle, held hands, and they asked that I lead the prayer. We thanked God for the work of the seminary, prayed for the women who would find their home here, rejoiced at the global dimension of God’s church, and asked for safety for the workers. When we ended, the contractor said, “Good. Now we can begin.” It was an emotional and faith-filled experience, and our prayers will continue for the construction. As we left chapel at the seminary, we saw that a very large truck had backed down the hill into the seminary campus and dropped off many, many bags of cement for the building. They couldn’t get close to the construction site, so several young men each stood with his back to the truck as the men on the truck placed a large sack on his shoulders. Then the carrier sprinted to the construction site where he delivered his bag. Construction is an entirely different enterprise here. In the afternoon Girma and I met with President Iteffa, the head of the synod. We had an honest and open conversation about the challenges facing the synod. He expressed his gratitude many times for our work with the hospital and the seminary. At the end of the meeting, I presented him with a prayer shawl. I wrapped it around his shoulders and told him that, when he faced difficult times in the synod, he should wrap this around him and he would know that the prayers of the people of God at Good Shepherd surrounded him. He was moved. We finally made it to Aira Hospital! It was such a great day getting to know the hospital staff and meeting some of the patients. Ron, Girma and I spent the first half of the day meeting with the administrative team to talk about issues that the hospital is facing. Ron, as a representative from Global Health Administrative Partners, led the meeting. In the afternoon I met up with Ruth, the nurse matron. She is a very kind, warm-hearted women and was so excited to show me all around the hospital. She showed me all of the hospital wards such as maternity, pediatric, medical-surgical, etc. Each ward was one big room with about ten beds inside, very different than what you see in the hospitals in the U.S. It was also extremely interesting to see the admissions area and see how many patients show up for care each day, and learn about how far some of the patients had traveled just to get to the hospital. I also met up with Dr. Tariku and he showed me around the operation suites. It was amazing to learn about the types of the surgery that they are able to do with lack of resources, staff and the conditions of the operating room. I’m hoping to be able to see a surgery with Dr. Tariku tomorrow. Also, while I was touring the hospital I ran into a women who was wearing scrubs from Mayo Hospital in Eau Claire, which is the hospital I do nursing clinicals at back in the U.S!!!!! I tried to talk to the women about it, but she didn’t speak English well. Someone must have donated them to the hospital at some point. I was astonished at how small are world is after seeing this! Later on in the afternoon, Ron and I met up with the director of the nursing and midwifery school. It was so interesting to learn about their program. Right now the midwife students are doing their practicum in the hospital, and 32 of them will be graduating by January of next year. It’s very exciting for the hospital and clinics to be able to use these nurse midwives. The infant and maternal mortality rates are extremely high in Ethiopia, and they’re in need of maternal and newborn care. On Monday morning, I’ll be meeting with all of the nursing students. I’m very excited to get to know all of them. It was such a great day at the hospital! But I was very excited to head back to the guest house and get some rest after a long day. In the evening we had dinner at our guest house, and then there was a knock on the door. It was Rev. Tadese (from the seminary) and Megersa (head of the nursing school). How fun it was to sit together and hear stories and learn more about each other. There was much laughter. God has delightfully endearing people in every part of the world! We rise early this morning so that we can set out for Aira. Drivers from the BirbirDilla Synod in Aira are coming to pick us up. This journey has been a two-day trek in the past over very difficult roads under construction. Now the highway is complete, and we intend to zoom to Aira in only one day, darting past sheep and goats on the highway, children going to school, farmers transporting crops, women carrying sticks for fuel. When we get to Aira, we will find the guest house we have been assigned, then assemble for dinner with our hosts. It will be a wonderful meal and a time to greet long-time friends and new colleagues. Since we were last in Aira, a new hospital administrator has been named; he will be very important for the work Rachel and Ron will be doing this week. The first time we were in Aira, we had gone into the countryside to see the Yubdo Project, the agricultural project that Good Shepherd sponsored in 2006 and 2007. As we were standing at the river, looking at a capped well (which provided clean water to the surrounding farms and villages), the rain began, and we were drenched. We struggled up the muddy river bank and into our vehicles. We just wanted to get back to the guest house and dry, clean clothing. However, as we drove into Aira, the leading vehicle veered right onto a side street and up to Lalo Aira Congregation. We walked in and found the elders (congregational council) meeting there. We exchanged greetings, and then they invited us to kneel at the altar while they prayed for us. Laying their hands on us, one of them, a woman, prayed with increasing fervor and passion. And though we did not understand the words, we knew that God was there. It was holy ground. There was no fire, no burning bush, but the Spirit brought us together in an undeniable way that day. It was an unforgettable moment, one way God brought the church in Aira and Good Shepherd together. Tuesday was travel day – all the way to Aira in one day. It was a long day of riding. We left Addis Ababa at 8:00 a.m., after a half-hour of stowing all the suitcases on the top of the LandRover. We had brunch in that wonderful hotel in Ambo (about two hours west of Addis Ababa, where we sat outside among the flowers). Then it was a full day of just riding. Because there were seven of us (we four, Rev. Tadese, a guest lecturer at the seminary named Michael and the driver) returning to Aira, we had a LandRover with low seats along the sides, facing each other, potentially holding 10. We filled the vehicle (with drinking water, snacks, each person’s carry-on, and a couple suitcases that would not fit on the top. Because the seats are so low, there was a lot of shifting and stirring, trying to maintain a comfortable position. But the scenery was breath-taking. It is the end of the rainy season, so everything is beautifully green and lush. In fact, we saw many, many farmers coaxing teams of oxen pulling pretty basic plows through fields. “Yes,” Tadese said, “this is our planting technology here.” Teff (the grain from which the Ethiopians make budena – bread – is still green and will be ripened in November or December. Corn is nearly ready for harvest. In fact we got some roasted corn (on the ear) along the highway, one of our snacks on the long trek. And yes, the highway is completed all the way to Gimbi, and there are sections paved between Gimbi and Aira. What a pleasant ride this year! But even though it’s a paved highway, it’s still the same thoroughfare filled with a wild collection of travelers – men with canes hoisted over their shoulders, women carrying enormous bundles of sticks, little boys herding cows, kids walking to and from school, horses and donkeys pulling an astounding variety of homemade wagons and carts, calves which for some reason frequently stepped right in front of the LandRover (we didn’t hit any, but that was due to the skill of the driver), flocks of sheep (tails down) and goats (tails up) meandering near the edge of the highway, and semi-trucks, three-wheeled scooters and Toyota pickups cutting in and out of traffic – just like us. We arrived in Aira at 7:00 p.m., unloaded the collection of suitcases and bags from the top of the LandRover, then were hosted by Rev. Tadese at Onesimus Nesib Seminary for dinner. We’re home now – in the home inhabited through the years by the expatriate doctor serving here. No visiting doctor right now, so we have moved in. It’s a lovely home that looks out over a deep valley full of plants and animals. We will enjoy this spot. Tomorrow Ron and Rachel start working with hospital staff. Girma is going to help them get started, and I’m going to start the day with worship at the seminary, then probably sit in a few courses there. While we have a list of things to do, schedules are very fluid here, and we will be nimble! We have this one day in Addis Ababa before we head west. There are a number of items on our agenda today: First, we will meet with staff from the social ministry department of EECMY; this is the department that oversees the Aira Hospital, along with numerous other social ministry organizations within the church. When Ron and Martha were here two years ago, this was an important connection. Then, this afternoon we are going to Burayu-Katta, to meet many of the REAL girls we at Good Shepherd support. These beautiful young women, along with school directors Immanuel and Elfinish, are inspiring. The girls see a new future because of the scholarships they receive; they now have options for the future! We hope also to meet some of the girls we had supported who have graduated, who are now in university. And Immanuel and Elfinish are inveterate optimists – people of faith and vision. He said to his people, “Look, the Israelite people are more numerous and more powerful than we. Come, let us deal shrewdly with them, or they will increase and, in the event of war, join our enemies and fight against us and escape from the land.” Therefore they set taskmasters over them to oppress them with forced labor. They built supply cities, Pithom and Rameses, for Pharaoh. But the more they were oppressed, the more they multiplied and spread, so that the Egyptians came to dread the Israelites. The Egyptians became ruthless in imposing tasks on the Israelites, and made their lives bitter with hard service in mortar and brick and in every kind of field labor. They were ruthless in all the tasks that they imposed on them (Exodus 1:9-14). This is the church in which we are living during these days. The American Guest House is on a busy thoroughfare in Addis Ababa, not far from the city’s center. We have rooms in a fairly new building – each with a bedroom/bathroom, connected to a central gathering space and a kitchen. We are very comfortable and secure here. As is typical in Ethiopia, the Guest House buildings are in a gated compound. Our rooms became a hub of activity on Sunday. Rev. Tadese, the president of Onesimus Nesib Seminary, spent a full hour here late morning, talking about the plans for the seminary, his role as vice-president of the synod and the dormitory construction. He was in Addis Ababa on Saturday so he could order cement for the dormitory building that our 10% for Mission funds are helping to construct; on Sunday he picked up a teacher who will be at the seminary for a few weeks. Not only a seminary administrator, he’s also a general contractor! Other leaders of the Ethiopian Evangelical Church Mekane Yesus also stopped by. In late afternoon we were delighted to welcome President Iteffa, BirBirDilla Synod president. He is here for a meeting of all the synod presidents (and a few smaller gatherings) and will be returning to Aira on Monday. Then, later this afternoon we were honored to greet Rev. Yonas Yigezu Dibisa, the executive director of the church unit responsible for mission and educational institutions. Rev. Yonas had been in Minneapolis this summer, and Pastor Samuelson and I were delighted to meet him for lunch. He is a man of gentle spirit, but immense responsibility for the EECMY – directing the missionaries that the EECMY is sending out within Ethiopia and to other countries as well as the college, university and seminandary institutions of this church. We had scheduled dinner with various leaders of the EECMY, however, many of them were involved in a meeting regarding a recently developing issue in the church, and the meeting ran longer than dinner! We were delighted to welcome Teklu Wadajo, who had traveled with Martha Gisselquist and Ron to Aira three years ago when they began the Global Health Administrative Partners relationship with Aira Hospital. Teklu was born and raised in Aira and like Girma has an ongoing interest in the institutions of the church there. A bank executive in Addis Ababa, he has been president of the very large “mother church” of the EECMY, Mekane Yesus Congregation in Addis Ababa, has served on many significant boards and committees of the church, and is a candid source of information and advice. He also is a delightful dinner companion. In addition to serious discussion, there was uproarious laughter in our corner of the dining room! Back at the Guest House, we crashed. It was difficult to get much sleep on the plane and, while Rachel and Ron had found a bit of time to nap Sunday, Girma was on the run with our driver getting supplies and I was welcoming visitors, so our bleary-eyed, jet-lagged group was grateful for quiet and sleep. Tomorrow we are in Addis Ababa and Burayu-Katta all day. Tuesday we leave for Aira. Monday could not have worked out better for us! First we drove over to Ethiopian Evangelical Church Mekane Yesus headquarters for their social ministry work. We were able to meet with Dr, Abeya Wakawaya, the staff person who is responsible for planning and evaluation for their social ministry organizations. In addition, he’s is deeply interested in the health and future of Aira Hospital. He told us that Aira Hospital is doing very well right now, but that doesn’t mean they don’t have challenges. He looks forward to hearing about Ron and Rachel’s insights when we return from Aira. In fact, we have an appointment with him bright and early next week Wednesday for that purpose. As soon as we got back in the van, the ideas started flying from Ron and Rachel, just based on Dr. Abeya’s comments. They begin the week at Aira already primed and ready to verify and evaluate. In the afternoon we visited the REAL gifts at Burayu-Katta. What beautiful young women! We met all 15 of the girls who people and organizations at Good Shepherd sponsor. When asked what they want to do when they finish university, there was a preponderance of “nurse” or “doctor,” with a number who want to be an “engineer” too. Rachel talked with the girls, telling them how she started on the road toward being a nurse; you could see their interest, hearing from a young woman who has succeeded at what they dream of doing. Girma, an engineer, told the five girls who say they want to be engineers that they need to like math. Every one of them smiled and responded that it was one of their favorite classes. The give-and-take was delightful. Others are focusing on careers as a psychiatrist, a judge, an economist. No one wants to be a publisher. It’s my burden. After Burayu-Katta we zoomed over to a restaurant which specializes in traditional Ethiopian food, music and dancing. The food was fabulous. The dancing and music was very interesting. Both our driver, Berhanu, and Girma were invited to join the dancers on the stage, but both demurred. Now that would have been a sight! We didn’t stay late, so we missed the Oromo dancers. There were phone calls to be made and blogs to write. Plus we hope to leave early for Aira. We leave Minneapolis on a 7:00 a.m. flight, going first to Toronto, Ontario, Canada, then flying directly from there to Addis Ababa. Because Ron lives up in Cross Lake and Rachel has been at school in Wisconsin, we have not had time for all four of us to meet together before leaving. We will use traveling time to talk about plans already set in place, other ideas and the people who will be hosting us. Then Jacob asked him, “Please tell me your name.” But he said, “Why is it that you ask my name?” And there he blessed him. So Jacob called the place Peniel, saying, “For I have seen God face to face” (Genesis 32:29-30). “Waaqayyoo si’i ebbisu” (Wok’-a-you say’-a eh’-bih-su). That’s “God bless you” in AfanOromo, the language of the people of God in Aira and many places throughout Ethiopia. We expect to receive God’s blessing as we spend time with them during the next 14 days. We expect to see God’s face in the people we will meet. We will be blessed. Thank you for walking with us on this journey with our brothers and sisters in Ethiopia. At 5:00 a.m. Saturday morning we gather at the Air Canada counter at the Minneapolis-St., Paul airport -- Rachel Stein, Ron Ommen, Pastor Samuelson, Bob & Laura Stein, Nancy Liddy and me. Rachel, Ron and I are ready to start our great adventure to Ethiopia. The others are there to say goodbye and send us on our way with blessing and prayer. Pastor Samuelson begins with Luther’s morning prayer -- a wonderful and Spirit-filled sending. They stand with us while we check in – each person with one bag of their own clothing, etc., and one or two additional enormous suitcases of medical equipment. We are so grateful for the donations of suitcases from folks at Good Shepherd! Nancy Liddy has packed each of the bags with equipment supplied by Global Health Ministries – all of it needed and requested by Aira Hospital. Each time another bag went up on the scale, we look carefully at the weight – will it be under the 50 lb. limit? Nancy is amazing – two of them are 49.5 pounds, with the others close behind. A cheer goes up from the group when each is approved. We are ready to go – but where is Girma? Our long-time friend in this relationship with Ethiopia, Girma is a delightful traveling companion and a keen translator of language, culture and people in Ethiopia. He is originally from Aira, and has continuing contacts and involvements there. The time ticks by; 5:30 comes and goes. We decide to start our trek through security, hoping Girma shows up at the gate. Then we have a glimpse of him and his wife, bringing his two large bags to the Air Canada counter! He has arrived at the last moment, but he is here. His weighing skills do not quite equal Nancy’s, and he and his wife with Nancy’s help carefully select the items to be left behind. Girma explains that, when Ethiopianacquaintances find out you are going “home,” they bring items they want him to take along to family and friends. He has already refused the two bags of shoes his sister wanted him to carry to his mother in Addis Ababa. Now, a few other things are left behind. As we turn to move through security, Laura Stein remarks to me, “You keep taking my children off to Ethiopia.” I respond: “And the first one [Emma] came back safely!” We say goodbye to family, friends and pastor. The journey has begun. Air Canada takes us to Toronto. It’s a small plane, with only four seats across. Rachel and I share a pair of seats, and Ron is across the aisle. It is a good time to learn a bit more about these traveling companions. It will be 24/7 for two weeks. So far, so good. I have learned already that Rachel is a hilarious story-teller! Girma is a few rows ahead – and he is the rock star. He has met several people at the gate who he knows who will be on the same flights as we are. Plus there is a small group from Hosanna, Lakeville, who are traveling to Hosanna in south Ethiopia. Girma and his family worship at Hosanna, and this group is eager to connect with him: photos, hugs, shouts of his name. We just hope it won’t go to his head! Right now we are mid-flight from Toronto to Addis Ababa. It’s relatively quiet on the Ethiopian Airlines flight. I realize I have no idea what time it actually is. The windows are treated so that it appears to be night outside, and lights are low – they want people to sleep and rest. It seems they have created an alternate reality for us on the flight. We’ve had a luncheon, a sandwich, a few rounds of water and juice. Is it afternoon or evening, dark midnight or early morning? I don’t have a clue. (Ron tells me it’s 5:00 Minneapolis time, midnight Ethiopia time.) A monitor in each seat back lets each passenger choose their personal distraction: a movie? a TV show? a game? Each traveler is in his or her own little world as we jet from North America to Africa. The monitor on the bulkhead shows where we are on the route. Right now we are flying over the Mediterranean, having passed over the Atlantic Ocean and Spain/Portugal. We’re just east of Barcelona. Five hours, ten minutes to Ethiopia. We’ll be passing the boot of Italy soon. I have two carry-ons this trip. One is jammed with gifts for our friends in Aira – two prayer shawls from Nancy Brenny (one for the president of the synod and another for the president of the seminary – a tangible prayer for them from Good Shepherd), some books we will use as gifts, a bag of delightful infant caps which Mary Ireland knitted for the hospital, gifts for the REAL girls from Carla Sykora, and a first aid kit that Parish Nurse Dorothy Ellerbroek assembled for us. Plus there’s an assortment of snacks (granola bars, Chex Mix, mints, even some M&Ms) for our day-long drive from Addis Ababa to Aira and back a week later. As I think about our schedule in the days ahead, the fluidity of those plans, and the surprises that God has in store for us (because there are always surprises, most of which are delightful), I think of the sending last Sunday at Good Shepherd. The prayer written by the third and fourth graders (our prayer partners for this trip) that Louis read during the sending resounds in my head: asking God to keep us safe, to help our Ethiopian friends prepare for our arrival, and that we may learn from each other. Amen.